A great project for using up a variety of your Christmas craft stash this calendar will make a great decorative feature for your home. 1. 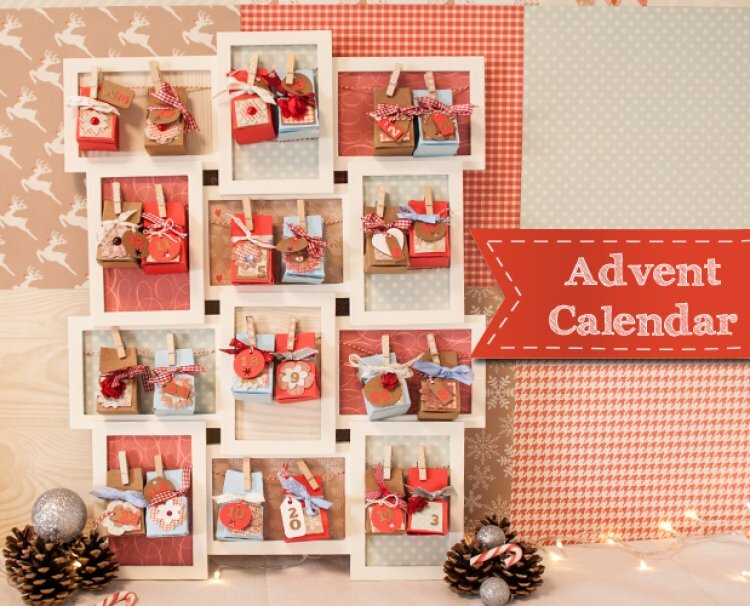 Download your free template and cut out 24 boxes in your chosen colours, glue them together. 2.Cover the front of the boxes with a square of paper cut to 3.5 x 3.5cms, use a variety of papers to jazz up your calendar. 3.Decorate each box with a numbered tag and we have also used blossoms and chipboard tags to add interest to each box but you can have fun decorating yours and making it personal. 4.Fill your box with a treat and then use a length of ribbon to tie the boxes closed. Now all you have to do is wait for the 1st of December when you can enjoy all the treats inside, we love this project as the frame can be used after to show off all those precious family memories made over the Christmas period.